LOS ANGELES, Calif. – Dec 20, 2018 – SmartFlow Compliance Solutions, a leading software-as-a-service (SaaS) provider of anti-piracy and software license compliance technology, announces the availability of SmartFlow Enterprise 2019 with over 50 innovative new data collection and analysis features and enhancements for revenue generation and business intelligence. SmartFlow Analytics is a best-in-class business intelligence and custom reporting module that helps customers make sense of the patterns that emerge from the usage data gathered through the SmartFlow platform. 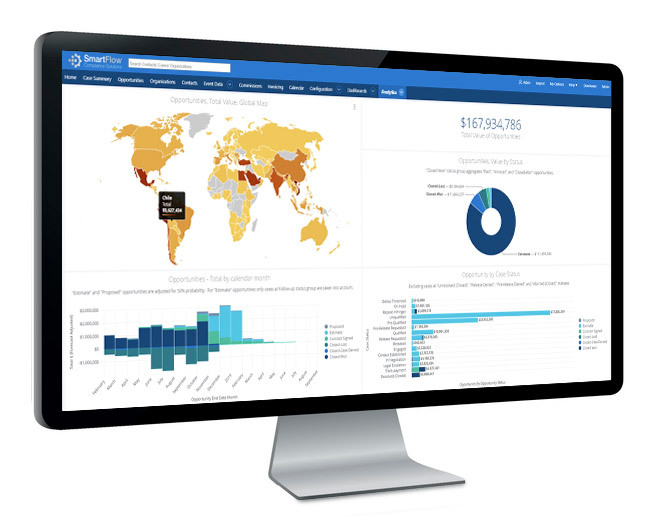 Customizable dashboards offer multiple summary business intelligence and reporting views that provide deep insights, enabling customers to make more informed decisions about addressing non-compliance issues, generating revenue, and staying ahead of the competition. SmartFlow is the only truly open license compliance solution on the market, allowing users to integrate with a wide variety of data sources, including SmartFlow, as well as proprietary and third-party sources, to drive their compliance program. Customers’ own software activation or other data can be correlated with usage data from SmartFlow’s software development kit (SDK), or, for example, Microsoft’s Azure Application Insights. This unique open approach enables enterprises to maximize the impact of their data for revenue recovery and business decisions. SmartFlow Enterprise 2019 supports the ability to link cases and opportunities in SmartFlow to accounts and opportunities in Salesforce. Enterprise also includes a representational state transfer (REST) API for downloading event data from the SmartFlow gateway. SmartFlow Enterprise 2019 is available immediately. There is a SmartFlow solution for every budget—even if your budget is zero. For more information and to discuss a solution that is right for your business, visit www.smartflowcompliance.com or contact us at info@smartflowcompliance.com. SmartFlow Compliance Solutions (SmartFlow) usage and analysis software drives the license compliance programs for the world’s leading software companies. SmartFlow, by providing precise telemetry data that ensures users are properly authorized and licensed, helps clients make informed decisions on the best way to correct licensing problems and protect customers from unfair competition. With a solution for every budget, the data collected by SmartFlow’s innovative technologies provides business intelligence and sales information and organizes, analyzes, and interprets that data into meaningful market insights and quality lead generation. SmartFlow’s license compliance platform can improve productivity, reduce operational costs, and guard against downtime by preventing malware attacks and protecting brand names and reputations. For more information on SmartFlow, visit smartflowcompliance.com.